Fierce is a honorable, romantic, loyal and sometimes quiet guy. He adores challenges and is very passionate about battle. He feels his worth as a man is within his strength and honor and he won't let anything come between that. His pride and love for challenges makes him somewhat of a hard-headed guy who may not think before acting. He can be a nice and friendly person when you show him respect and loyalty. He is a flirt, casanova and affectionate guy, but he does like his space. Loyalty is key into the heart and/or friendship of Fierce, he believes in loyalty strongly and thinks that no connection or bond could be made with such. An unloyal friend might as well be an enemy in his book. Though Fierce adores the attention he may receive due to his looks, he also does want to have a stable relationship at least for a certain amount of time and it can get pretty tiring for him. Fierce was born in a realm called Appelexxis in an area called Ignis Crystal Cove. The Appelaxxian Race were once spiritual beings that embodied the force of planets and worlds. Each tribe of Appelaxxian embodied a different kind of force for their world. Fierce is part of a line of Appelaxxians who interbreeded with other sapient beings. Fierce was born being believed to be the descendant of their Appelaxxian tribe's first leader and is believed to one day enherit his place as the embodiment of their tribe. He took it upon himself to see order all over the course of Appelexxis, so he took laws into his own hands in did what he feels is right. He saw no good or bad in almost anything. Eventually he stopped caring for Appelexxis after being ridiculed as a Vigilante and became a hunter for a short while. It wasn't until he met Aurora and Lore, two other Appelaxxian Tribe Leader Descendants, in a fight with both of them, he unlocked his full potential. He too saw no need in even trying to fulfill what was expected of him for being a possible descendant of an Appelaxxian Tribe Leader who once reached a power beyond any other Appelaxxian. To this day, Fierce has no true objectives yet, but he takes on whatever challenge that rolls by him. Currently, he takes up traveling. 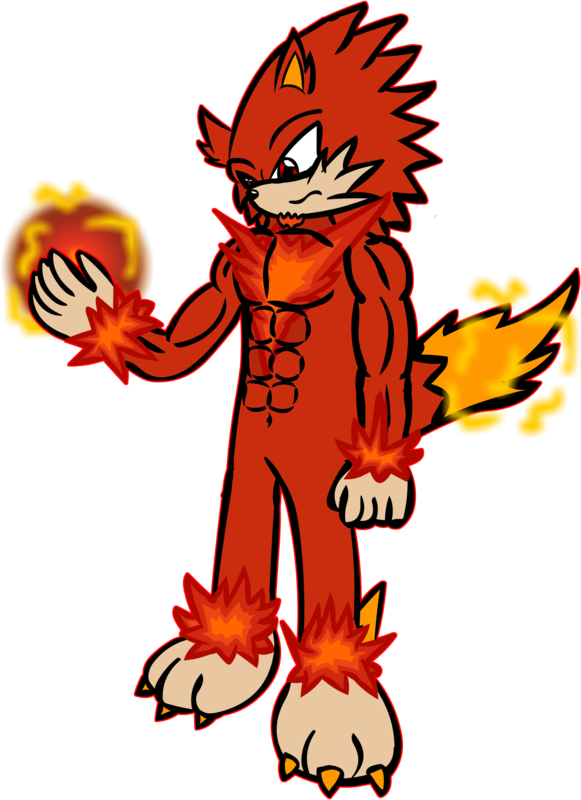 Fierce has the body of an anthropomorphic wolf covered in fur, ranging from colors of red and orange in various shades, peach just like his skin and yellow. He is quite fit and sports a long bushy tail. His feet are "dog-like" with only 3 toes and yellow claws. Another resubmission from my DeviantArt. An old one.